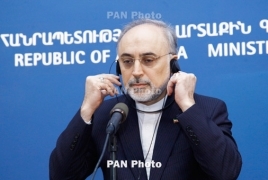 PanARMENIAN.Net - Head of Atomic Energy Organization Ali Akbar Salehi said that Iran as an advanced country in West Asia which pioneers introducing and developing radio-medicines is presently sending the drugs to 15 world countries, IRNA reports. Speaking to IRNA on Monday, Salehi said these countries include Egypt, India, Pakistan, Iraq, Lebanon, Syria and some European countries. Noting that Iran is both producing and conducting research on radio-medicines, he said the latest kind of these radio-medicines which was manufactured in Iran is used for curing Prostate cancer. Salehi said samples of the Prostate cancer drug are being tested in Tehran University of Medical Sciences, Shahid Beheshti University, Mashad and Shiraz universities. He stressed that 15,000-dollar worth drug is being given to patients for free. Elsewhere in his remarks, Salehi referred to enemies' attempts to sabotage Iran's radio-medicine production by sanctions. He said though enemies claim that they have nothing to do with radio-medicines, they in practice stop planes from carrying them to Iran or they impose sanctions on the companies which produce these drugs. Earlier, Salehi said that Iran had signed deals with a number of foreign companies to produce radio-medicine. He added the contracts are worth a total of 70 million in Euro. Iran will be able to even export radio-medicine to foreign countries once the project, labeled as GMP, becomes operational, the official reiterated.